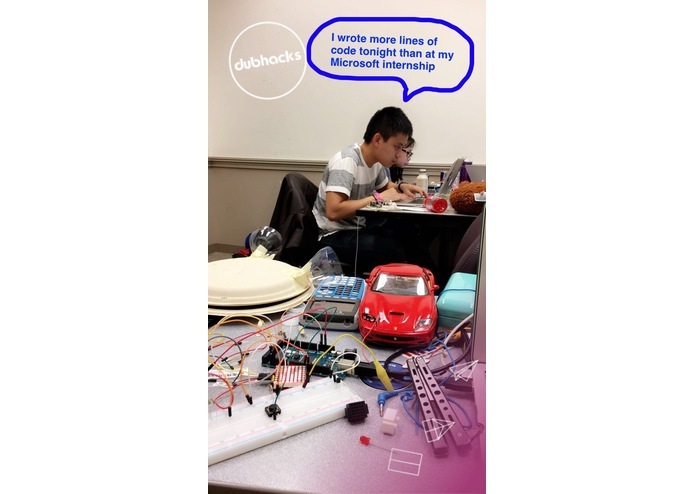 Going Dubhack's theme for social change, we decided to build a driving aid for deaf drivers and individuals hard-of-hearing as no such product currently exists. According to AAA Seniors Driving, many seniors are unable to hear high pitches such as ones from emergency sirens on the road which puts road users at risk. In addition, numerous published articles have elucidated the risk that deaf individuals take when driving, as well as the need for a deaf driving aid. 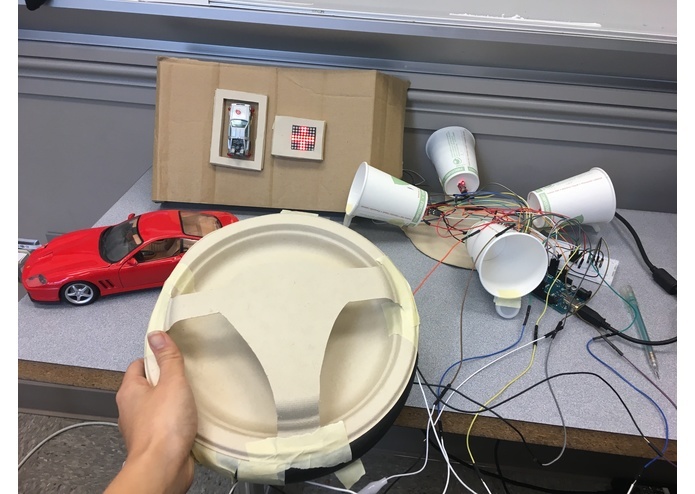 Inspired by console FPS video games where players receive haptic feedback and visual directional indicators when fired upon, we realized we could easily design a device to effectively fill this need. After giving it more thought, we also concurred that such a device would be incredibly useful to general road users as well, such as those that drive with loud music, or are easily distracted. These concerns and publications thereby reinforced our desire to create eDrive, in hopes not only to improve transportation security but also promote equity and driving access to more people. 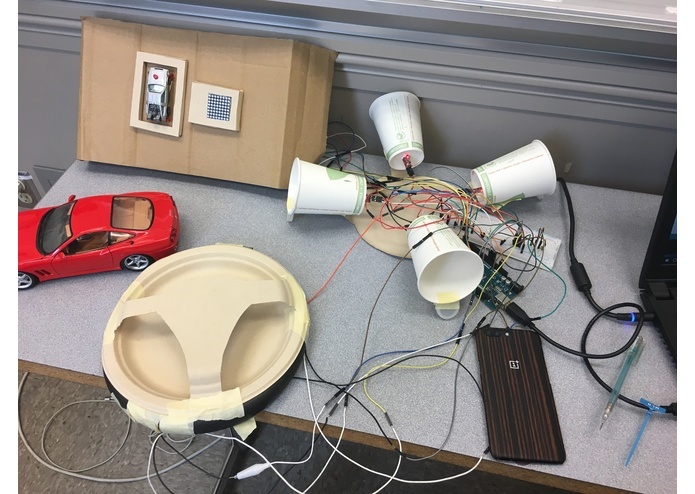 eDrive uses microphone modules on the four corners of a car to detect noise alerts (using an algorithm that samples background noise and checks for sound signatures). (such as emergency sirens police, ambulance). When an emergency siren is picked up or another loud honk/siren, the user is notified with (1) a slight vibration pulse integrated in the steering wheel, (2) an LED lighting up showing which direction the sound is coming from, and (3) an LED matrix display informing him/her of what type of siren/honk it is (e.g., cross for ambulance, officer badge for police, exclamation mark for unspecified honk). 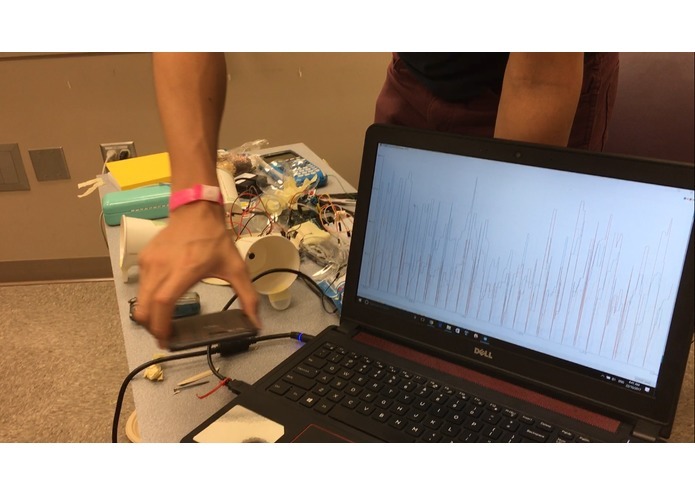 Arduino constantly gets input from sound, and uses simple moving average to detect a non-anomaly spike that could potentially be a road hazard. The Arduino then sends a packet of input (time and displacement) to a Java program via serial. The java program parses it, and applies fourier transform to get an output of (frequency and displacement). 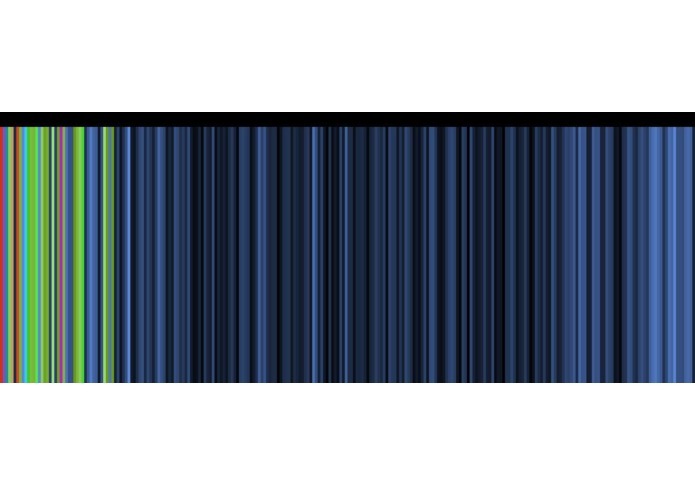 After receiving this input, the java program then runs a hashing function to map each frequency and displacement to a color, which is saved as an image. The image is then sent to a custom trained Clarifai Model to detect different sound sources. Currently, our model is only able to differentiate a police car from an ambulance. It then outputs the data back to the arduino via serial to display what hazard is present, and also which direction the hazard is coming from. Transferring sound input packages from Arduino to Java applet. 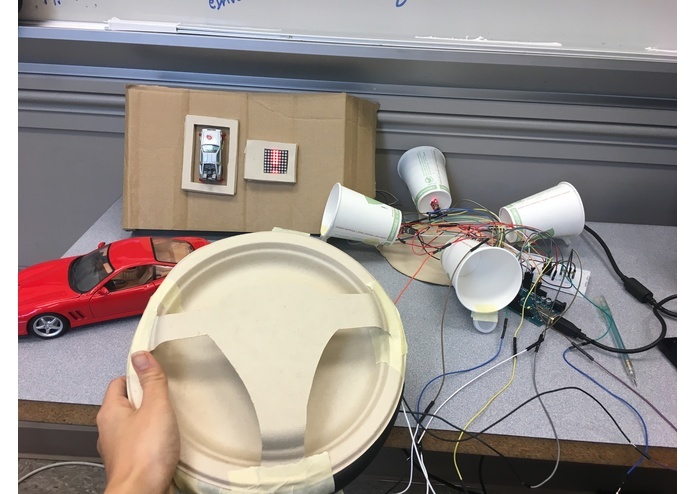 Due to the safety aspect of this project, we needed to be able to transfer input packages from the arduino to the java service to allow for quick evaluation. This is also very important problem because the data points needed to be close enough to keep the sound wave's properties. Applying fourier's theory. Fourier transforms requires a lot of calculation, and is often done in a analogue medium. We needed to run this fourier transform from a digital input, whose java library is not easily found. Machine Learning. The hash function needs to convert the frequency and amplitude graph to an image that differs between sound inputs. We are proud of how we managed to finish a complicated product within 24 hours as well as the positive impact it could have on the world. We managed to complete all of our goals in addition to our stretch goals, even after facing large engineering and design challenges. We are also proud to have all worked so effectively and efficiently as a team comprised of students of various educational backgrounds and levels. We all learned a lot from each other. 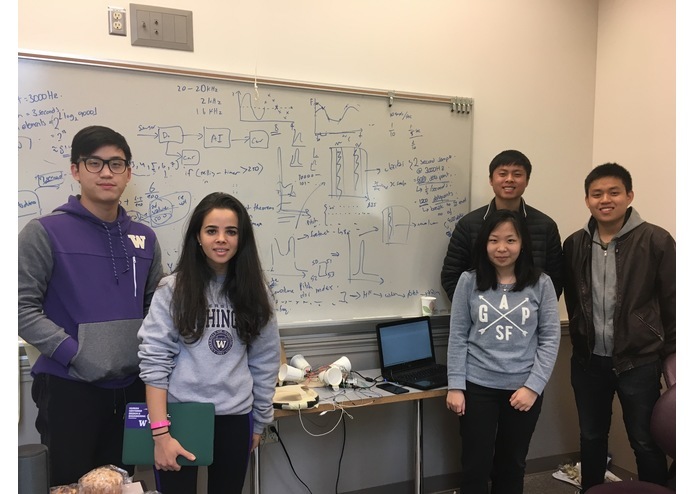 Our team was comprised University of Washington students from a variety of academic backgrounds and levels. We all contributed significantly to the project and all understood what was going on with all parts of the project. In other words, while some of us did not know some concepts with hardware, electrical engineering, software engineering, and/or machine learning, at least one person on the team knew and took the time to teach everyone. 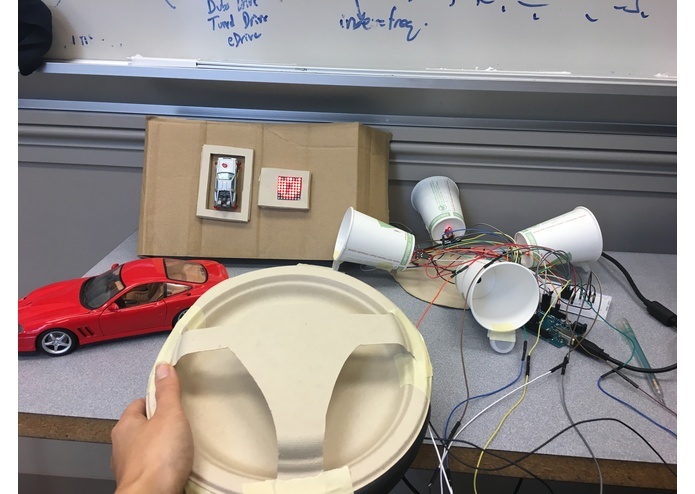 Rabea and I worked on the low-level programming and hardware: We designed and programmed the Arduino code, set up all the hardware components, and designed the low-level warning system with haptic vibration, type, and directional alerts. 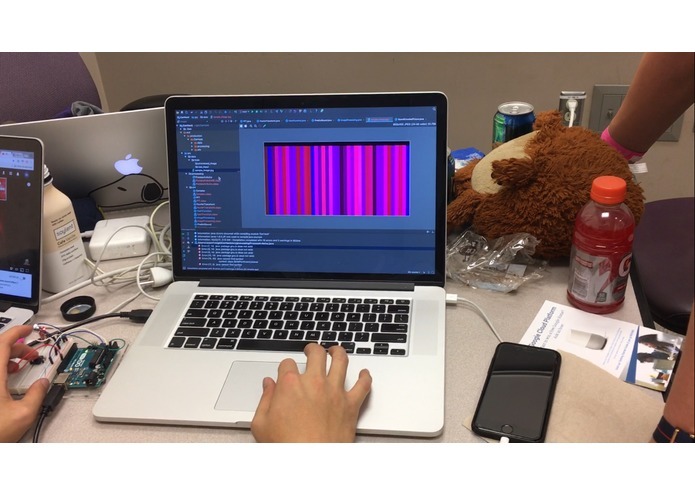 I also assisted Michelle in interfacing the Arduino with her program, and assisted Jason and Clifford in developing the conceptual plans for the image generation and using the output of the fourier transforms.